Headquartered in Mountain View, California, LinkedIn is the world's largest professional network. With over 450 million members worldwide, LinkedIn connects the world's professionals to make them more productive and successful. During the summer of 2016, I had the privilege of interning on LinkedIn's incredible Employee Experience team. 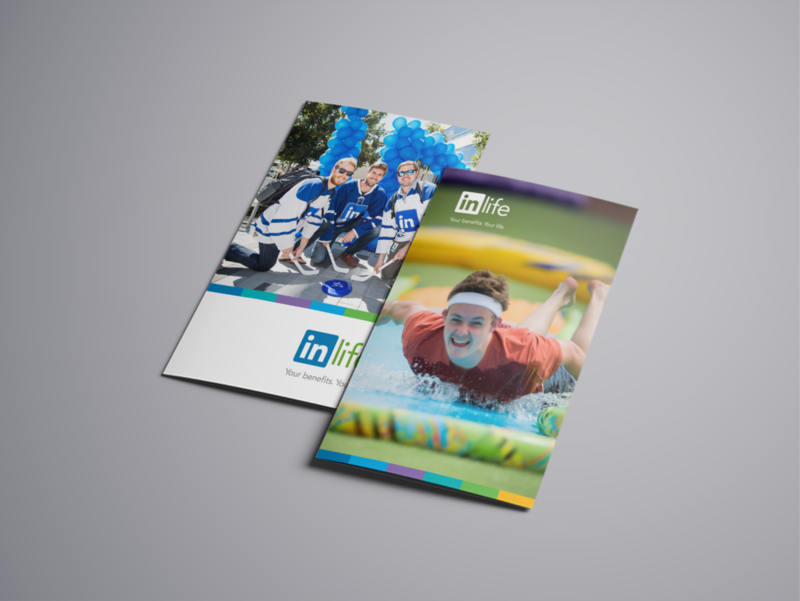 My task for the summer was to design a suite of print collateral to market LinkedIn's benefits, perks and employee experience events to three target audiences: 1. candidates, 2. new hires, and 3. current LinkedIn employees around the world. I had the honor of owning the project from ideation to print, and was the sole designer. Recruiters wanted something to give out at career fairs for prospective candidates to better understand LinkedIn's perks. New hires wanted something printed to refer to during the perks portion of new hire orientation. Current employees did not take full advantage of all of the perks being offered. 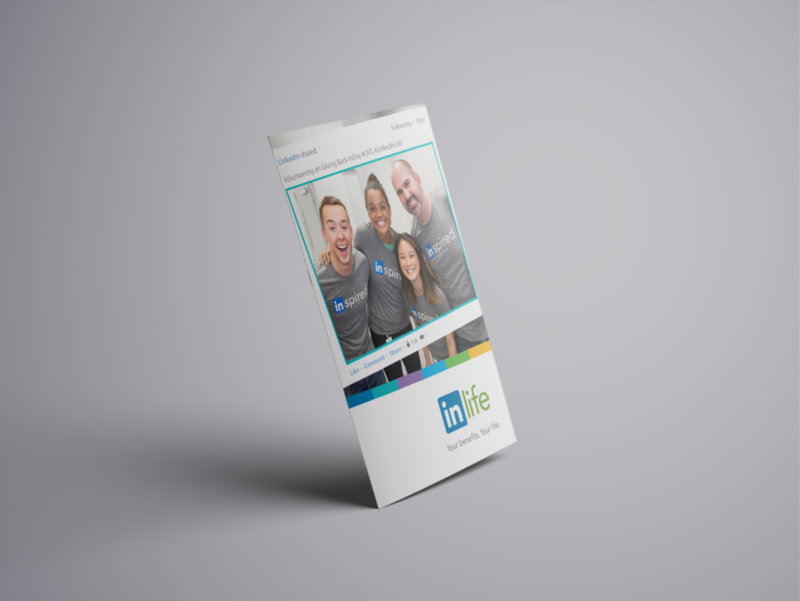 Create a piece of print collateral to market careers at LinkedIn, help guide new hires through orientation, and inform current employees of LinkedIn's global perks. Create an accompanying country-specific insert that details country-specific perks. I spoke with 25+ employees worldwide to better understand the benefits, perks and employee experience events at LinkedIn. Topics of discussion ranged from the Wellness program to education reimbursements, from LinkedIn For Good's charitable matching gifts to a paid year-end company shutdown, from Employee Resource Groups to the Speaker Series. I poured through new hire orientation materials, older open enrollment materials, and benefits and perks collateral from Facebook and Yahoo. without overwhelming the reader with a large amount of text. 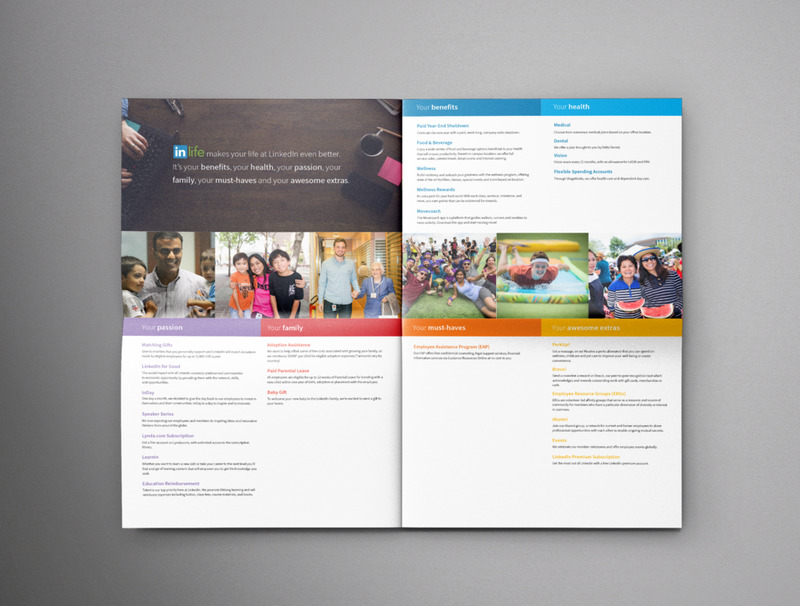 After sketching, I designed three brochure mockups paired with three accompanying inserts. Mockup 1: Tri-fold brochure with accompanying insert. Mockup 2: Bi-fold booklet with accompanying insert. Mockup 3: Newspaper-style brochure with accompanying insert. After user testing the initial mockups on the team and a design critique with the VP of Global Benefits & Employee Experience, we decided to move forward with the tri-fold brochure layout. I designed three more iterations of the tri-fold brochure and the country-specific inserts. I tested various cover images on the team, made copy changes after receiving feedback from respective perk program owners, and worked with legal to gather publicity releases for photographs. An iteration of the country-specific insert. After numerous rounds of edits with project stakeholders, the collateral was finalized. Overall, I created one global tri-fold brochure and eighteen different country-specific inserts. Additionally, my manager and I met with three print vendors and ultimately selected a vendor, paper weight and gloss for the initial print batch of 6000. The global brochure and accompanying inserts were well-received by the global team. The print collateral was immediately utilized at a company-wide Wellness Fair in October 2016. Currently, the brochure is utilized at new hire orientations around the world and at recruiting events/fairs. Additionally, to ensure project longevity, I created a design guide, a project management spreadsheet, and organized folders with all iterations and final artwork so content edits can be made as needed. The final product in action. Photo taken by M Portraits, used with permission.